Viele 16-20 cm Basslautsprecher sind geeignet. Submodul, Peerless HDS 205 oder z.B. Nova MDS 08. Nutzungsbereich von 30 - 90 Hz. passung und zwei verschiedene Sitzpositionen. furniture arrangement in club armchair format. 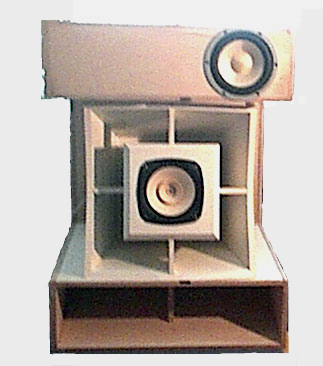 A lot of 16-20 cm bass speaker are possible. 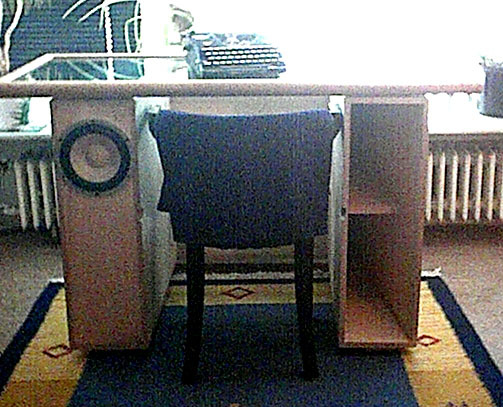 with an active subwoofer modul. Useful between 30 - 100 Hz. 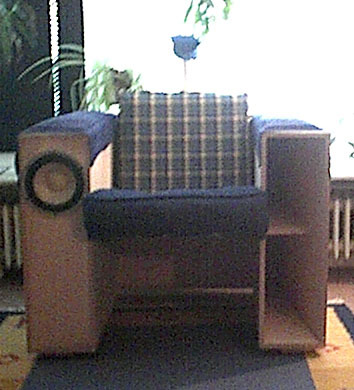 To use in small areas as listening place. one the most compact High End solutions at all. and get a very high-quality bass rendition. ment and two different seating positions. Although simply to build, self's building knowledge is necessary due to the partial number.Since soft fiber is to be worked on simply, many of the necessary soft fibre parts are easy to bevel.General references of building please reread in e.g. the bass tuba plan. soft fibre parts are easy to bevel. in der Mitte einen Halbrundstab anzubringen, ggf. auf einer schmalen 16 mm Multiplex. passende Kopfstütze, die in der gekippten Variante den Sitzkomfort noch einmal steigert.